The Liberal Arts have been a mark of a truly educated person since antiquity. In modern times, they have evolved to include humanities, social sciences, natural sciences and formal sciences. More often than not, a Liberal Arts degree program combines aspects of the aforementioned disciplines, but there are dedicated programs that zone in on a particular subject. Usually, most Liberal Arts programs serve as a great introduction to a plethora of vocations, preparing the student to work in a variety of sectors and opening up many career paths. Students are gifted with many necessary skills to transfer to the ever shifting work environment. It is a natural human tendency to desire to be among like minded people. Luckily for Liberal Arts oriented people who are strong and deeply invested in their faith of God, there is a great deal of Christian Liberal Arts Colleges for them to pick from. This article will present you with the top ten best Christian Liberal Colleges around the world. Not only will you enjoy higher education of the highest caliber, but you will do so in a Christian friendly environment, amongst a like minded student body and teaching staff. Messiah College, a nationally ranked, private Christian college founded in in 1909 is located in Mechanicsburg, Pa., just a 12 mile drive from the state capital, Harrisburg. It is of a broad, evangelic faith and welcomes a variety of Christian traditions. It aims to instill maturity, intelligence and a principled way of thought to its many students. It has more than a hundred and fifty undergraduate programs, offers twenty seven graduate degree and certificate programs, has three year degree option and the ability to undergo online, summer courses. Established in 1860, Wheaton College is a private, residential and interdenominational Christian Liberal Arts college with an extremely rigorous academic orientation. That is not to say, however, that the pursuit of faith is taken any less seriously. Their motto is “For Christ and His Kingdom”, which explicitly expresses their commitment to educate the students deeply in matters of Christianity. Situated in suburban Wheaton, a residential community 25 miles west of downtown Chicago, O’Hare and Midway International Airports it is really easy to access. Commonly abbreviated C of O, the College of the Ozarks works under a very interesting concept: Students work to earn their keep, rather than pay for tuition costs. Thus, by combining state grants and scholarships with the College’s on-campus work program, students from a poor background can end up securing high education with zero monetary cost. There is strong emphasis on character building with the College’s vision being the development of Christ-like traits in its students. It is located on a 1,000 acre campus in Point Lookout, Missouri. Abilene Christian University is a private, coeducational, Christian institution of higher education, located in Abilene, Texas. It was first established back in 1906. Currently, ACU is affiliated with the Churches of Christ. It has 253 full-time faculty members, 93% of whom hold the highest degree in their respective field. Students hail from forty one nations and study 135 different areas. ACU has 27 master’s degrees and three doctoral degrees. It is heavily oriented towards educating students for Christian service and Christian leadership throughout the world. The Russian-American Christian University (RACU) was first established in 1996, Moscow. It was the first private higher education Christian Liberal arts institution to appeal to students from all Christian backgrounds. It is self-described as a comprehensive liberal arts university grounded in historic, Biblical Christianity that offers students training in being agents of renewal and reconciliation in the university, church, society and the world of business. It includes the following departments: Business and Economics, General Education, Philology, Social Work and finally, Administrative Staff. Established in 1991, per the request of Lithuania’s Ministry of Education, Lithuania Christian College (LCC) quickly evolved to become an excellent faith based higher education institution. It is located in Klaipeda, an important Lithuanian port on the Baltic Sea. Classes take place in English, allowing the college to attract a multitude of students and faculty from all around the world. Each of its programs includes multidisciplinary core curriculum courses which affirm and enhance a student’s critical thinking and conflict transformation skills while simultaneously challenging them within a multicultural perspective and Christian worldview. Another private, coeducational, Christian liberal arts institution, Milligan College is located in the mountains of Upper East Tennessee. Founded by the Reverend Wilson G. Barker and established back in 1866 it serves today serves by “educating men and women to be servant-leaders”. It offers more than a hundred majors, minors and pre-professional degrees in Arts, Humanities, Business, Social Sciences and Education among others. Financial aid is provided in one type or another to 100% of all full-time, beginning undergraduates. 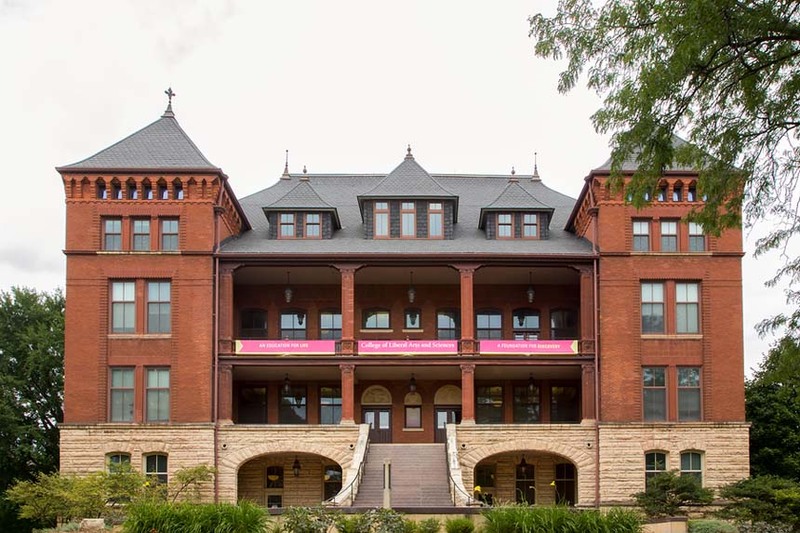 Located in Orange City, Iowa, Northwestern College is a private, coeducational Christian liberal arts institution, first established in 1882. It is affiliated with the Reformed Church of America. Its mission is to build an academic community that will propel students towards faithful and courageous living and pursue God’s work in bettering our world. It is a top-ranking institution and offers a wide variety of academic programs on many disciplines. These include but are not limited to: Biology, English, Humanities, Nursing, Philosophy, Political Science, Religion and Psychology. First founded in 1928, Hope International is a private Christian university identified with non-denominational Christian Churches. It is composed of five colleges, including Arts & Sciences, Business & Management, Education, the College of Ministry & Biblical Studies and College of Psychology and Counseling. As an institution, it has total commitment to the integration of faith, service and learning and is completely dedicated in bringing out the best in its students. Founded in 1891, Seattle Pacific University is a premier Christian university actively engaged in equipping its students with a desire to positively impact their communities around the globe. It is affiliated with the Free Methodist Church. Roughly four thousand undergraduate and graduate students are currently enjoying its superb education programs. SPU’s aim is to instill in them competence of character, knowledge and wisdom through rigorous academic courses and a trans-formative, holistic student experience.